The danger to several churches which some mayors wish to see destroyed and which we have often mentioned here is still very real but circumstances have improved for some of them. We feel it is time to take stock by pointing out these victories as well as the new threats which continue to appear. The first show that the worst can be avoided, that a solution can always be found, contrary to what elected vandals would have us believe. The church of Gesté saved ? This article which allows us to review the situation today - at least for those buildings we have mentioned, as it is impossible for us, alas, to be exhaustive - is a result of some excellent news : the association created to defend the church of Gesté (ill. 1) in Maine-et-Loire (see article) (Association Mémoire Vivante du Patrimoine Gestois) has scored a significant victory since, after being rejected in its first trial before the administrative court, has won the appeal. The demoliton permit issued by city hall has been canceled and the city has been sentenced to pay the fees for the expert’s appraisal (16, 661.21€) and reimburse 2,000€ to the association. The taxpayers in Gesté will no doubt appreciate having to pay these amounts which could have just as easily gone towards restoring the building. But the reasons given by the court for refusing the construction permit constitute the most satisfying element of this judicial decision. 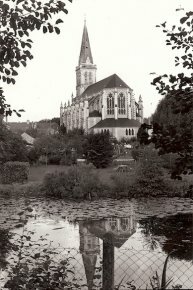 It in fact considers that, though the church is not protected by a listing as a historical monument (which, in our opinion, is not normal), the building still presented an "architectural interest, particularly due to its neo-gothic reconstruction", as proven in a letter written by the Directrice régional des affaires culturelles to the Mayor of Gesté on 2 July 2007, and also the opposition to the demolition of the church expressed by the Service départemental de l’architecture et du patrimoine (SDAP) of Maine-et-Loire "for the reason that it presented a certain interest justifying its conservation and restoration, stage by stage with maintenance work", given its originality amid the production of the diocesan architect, Alfred Teissier, because of its "organization on two levels". So it is in fact thanks to its architectural importance that the demolition permit for this church was canceled by the Tribunal administratif, confirmed by the court’s appraisal which considered that "by its disposition, volume, split levels, the church constitutes a dominant and architecturally attractive element of the city" but also that it could not be considered as a "threatening ruin". The Court’s conclusion is overwhelming for this elected official : the mayor "could not have issued the demolition permit for this building without having marred his decision with a manifest error in appreciation". We hope it will set a precedent. 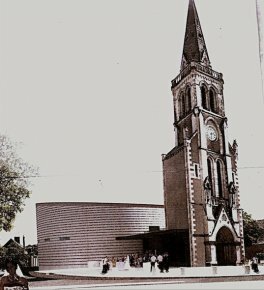 Although the DRAC and the SDAP played a positive role in this case by confirming the quality of the building and the possibility of restoring it stage by stage, evaluations which counted in determining the court’s decision, in our opinion it is clear that their decision not to classify the church as a historical monument is also "marred with a manifest error in appreciation". Their role was important but, once again, without the mobilization of citizens by means of an association who took the risk of voicing their opposition to the mayor, this church would have been destroyed. The Art Tribune also played a part in this decision. Alain Durand, the president of the association, told us that it was our first article which convinced them to fight for preserving the church, helping them to realize that they were not alone in their fight. The association was in fact created on 30 July 2007, that is shortly after our article appeared and was commented in the media. However, this does not mean that the fight is over since city hall might still decide to appeal before the court of Cassation (final appeals court). It would be wise for the DRAC to rethink a now outdated decision and benefit from the occasion to take the high road in resolving this matter. 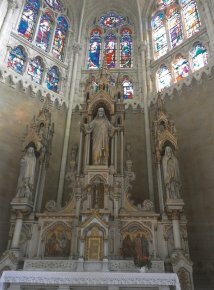 As we did in the case of the two churches in Lyon (see article) and as we intend to do systematically from now on everytime we write about a monument which is not protected but deserves it, we will send a letter to the DRAC requesting protection for the church in Gesté. At the same time we heard the good news about the cancellation of this demolition permit, another association informed us that, again in Maine-et-Loire, the neo-gothic church of Sainte-Gemmes-d’Andigné, designed by Alfred Tessier, the same architect as the church in Gesté (ill. 2), was in turn in danger of being destroyed by the city. The affair is practically the same and the arguments are identical : it would cost too much to restore the church - although it is not in a threatening state - and the destruction-reconstruction (with conservation of the bell-tower - ill. 3) would be too expensive. In short, according to them this is the only possible solution. We were able to contact the mayor by telephone who, while emphasizing that this decision "does not make anyone happy", is surprised that this news "has created a buzz" when it results from a decision approved by the Municipal Council in September 2010, that is a year and a half ago. The estimated cost for the restoration (3 million euros) seems to have been confirmed by the studies which were carried out... ; to sum up, there would appear to be no other solution and this is "the right one at the moment we made it". We asked him then if he thought it was still the "right" one today and he answered that he did not know, that "good and bad were a philosophical notion" and that he was not here to philosophize. This is too bad. We can indeed ask ourselves the following "philosophical" question : should we accept to destroy a village church claiming that it is too expensive to restore ? It sometimes helps to step back and reconsider but the facts here do not even require it. The association has, on its own, worked at finding alternative solutions. And it is now contesting city hall’s figures, supported by expert appraisals. The city claimed that the demolition followed by a reconstruction would cost 2,100,000€ as opposed to 3,100,000€ for the restoration. We have no reason to doubt the first figure, which city hall has no interest in overestimating. As for the second, even admitting that it is correct, does the difference between the two justify the destruction of this landmark ? Here we have a philosophical question (to which we would answer "no" without hesitating). But is the figure of 3,100,000€ exact ? We can legitimately doubt it, as it concerns a church which is not in poor condition. 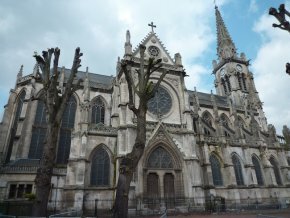 The association thus requested an estimate for a project by one of the chief architects for historical monuments, also an Inspecteur des monuments historiques, François Jeanneau, who in fact also knows this church well as he worked on it when ensuring security measures there. His project, which was forwarded to us by the association (and for which the total amount was confirmed by his office), states the total as 1,500,000€, that is half the amount quoted by city hall, and 600,000€ less than the project for destruction-reconstruction. Five phases of work are planned, these could easily be carried out over a period of five years, even more, thus spreading out the costs as opposed to a destruction-reconstruction project which cannot be as long. Furthermore, a renovation by stages would provide access to subsidies by the Conseil Général which would go up to 200,000€. That is 800,000€ less than the destruction-reconstruction proned by the mayor. 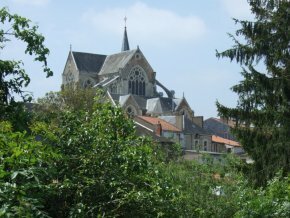 No doubt the decision of the Administrative tribunal concerning the church in Gesté, clearly in poorer condition than that at Sainte-Gemmes-d’Andigné, is sure to bring a chill up his spine. Just like the "buzz" that is now going around. This church also deserves to at least be classified as a historical monument. 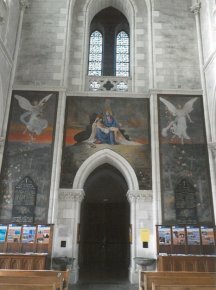 Besides its elegant silhouette and its beautiful interior architecture (ill. 4), it holds some interesting stained-glass windows (ill. 5 ; restored in 1986-1987), three large maroufled painted canvases, produced by Paul Audfray between 1923 and 1928 (ill. 6) which form a monument to the fallen of 1914-1948, a large master altar (ill. 7) and an ensemble of furnishings . Is it religious fervor which is pushing the parish priest to support the destruction of this church in favor of the very ugly building planned by city hall ? Church of Arc-sur-Tille : located in Burgundy, this beautiful neo-classic building is seriously threatened ; fortunately, as we have already said here (see our articles, in French), the mobilization of an association has paid off and even cost the mayor his post. Since then, what was considered impossible has now become possible : the church has been saved and will be restored. 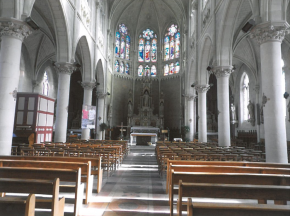 Church Saint-Jacques d’Abbeville (ill. 8) : we contacted the municipality and the person in charge of this case told us that "the mayor never intended to destroy this church". Although a final decision had not yet been made, our investigation there (see article) showed that it was imminent. The mobilization thus paid off and, in any case, we should commend the city mayor, Nicolas Dumont, who made the brave decision we so wished for : favoring the conservation and refusing the demoliton of the building. The roof, which leaked, is now protected with tarps and the gutters have been cleaned. The situation is thus for the moment stabilized although nothing has been done yet. City hall told us they were waiting for a study from the DRAC. Church of Valanjou : although the building (see article) is still standing, city hall has managed to cut off the top of the spire, an extremely serious act, especially since it is not doing anything to provide maintenance for the rest of the structure, thus simply waiting for it to collapse by itself. However, the association for the defense of the church has had the church reopened for occasional services, proving that it presents no danger. Although dormant recently, the association plans to step up its activity, newly motivated by the victory of the association at Gesté. Are the mayors in Maine-et-Loire different from those in other French regions ? Nowhere else is there such a concentration of elected officials wishing, purely and simply, to raze the churches at the heart of their villages, and some of them having already done so. Le Fief-Sauvin (destroyed in 1997), Saint-Georges-des-Gardes (destroyed in 2006), Gesté (threatened with destruction), Valanjou (threatened with destruction, already started with the bell-tower), Sainte-Gemme-d’Andigné (threatened with destruction)...this is not even an exhaustive list, since for example the church of Saint-Aubin-du-Pavoil, in the community of Segré, is also seriously threatened (see here). Do the mayors in Maine-et-Loire know that in many cities and villages in France, with the same meager resources as theirs, the elected officials are fighting for their heritage and manage to accomplish the desired restorations ? A solution can always be found. Especially when the problems are mistakenly stated from the beginning. The entry in the inventory to the Mémoire database indicates : "Of note are the wealth and variety of the interior décor (glass, sculpture, furniture, painting) also of neo-gothic inspiration and evidence of the religious fervor of the time". Next article in Heritage : Versailles : 520,000 euros per Hectare !